1 - Indian Railways Will Spend Rs 8,000 Crore To Induct 40,000 Coaches With New Interiors, Bio-Toilets. 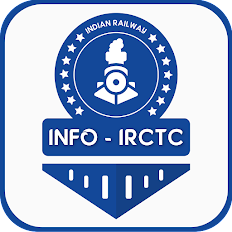 As part of a new venture to provide passengers world class comfort and travel experience, Indian Railways is planning to induct a total of about 40,000 coaches with improved interiors and high end facilities at a cost of approximately Rs 8,000 crore. There will also be attempts to provide safety features in the train coaches including well equipped couplers to prevent the train from overturning during accidents. Also part of the new plan is the attempt to renovate interiors, improve seating arrangements and design bio-toilets among many other facilities. The work plan envisages retrofitting of 1000 coaches in the current fiscal, the number will increase to 3000 in the next fiscal and 5,500 coaches in subsequent years. The contract valuing Rs 1,050 crore for electrification of 781 route kilometres (RKM) was awarded by Central Organisation for Railway Electrification (CORE) and Konkan Railways. 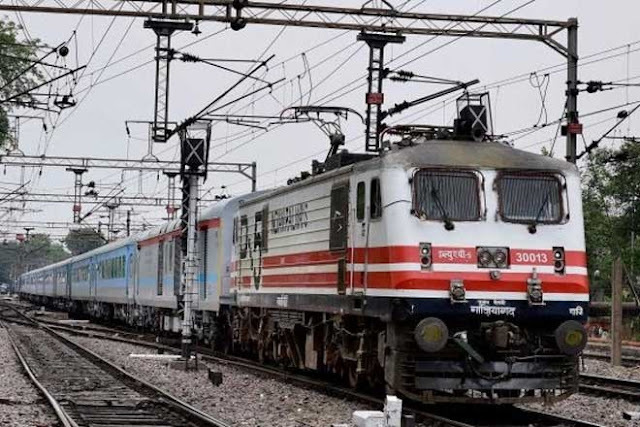 The contract was awarded for electrification of Delhi Sarai Rohilla – Rewari and Alwr – Bandikui – Jaipur – Phulera – Ajmer (353 rkm) section at a cost of Rs 594 crore and Roha – Verna (428 rkm) of Konkan Railway at a cost of Rs. 456 crore. Also, eight agreements were also exchanged between Zonal Railways and Public Sector Undertakings for 1,735 rkm of electrification projects valuing Rs 1,746 crore. The national carrier aims to reduce its total energy bill by over Rs 4,000 crore per annum through rapid electrification. 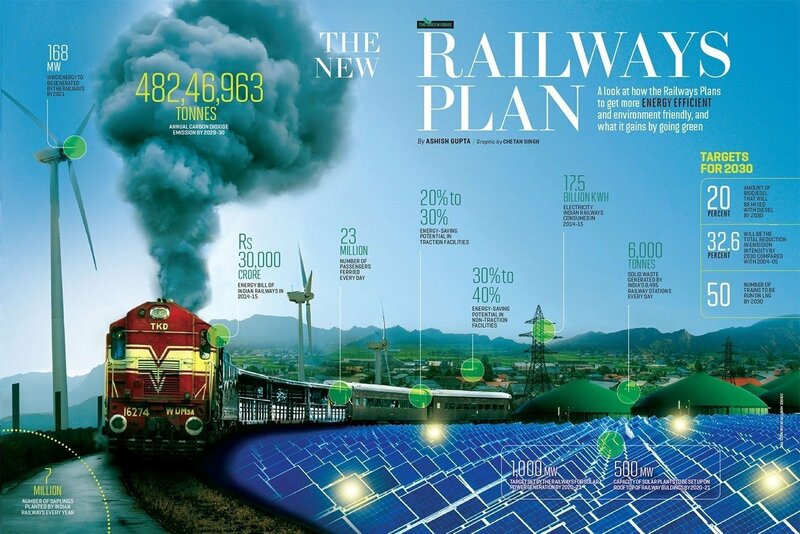 At present, only 42 percent of the total Indian Railways network is electrified. The rail ministry plans to increase its electrified network to 52,400 rkm by 2021. On completion of 90 percent of railway electrification, the national carrier expects its total energy bill to come down to Rs 16,000 crore as against Rs 26,500 crore at present. 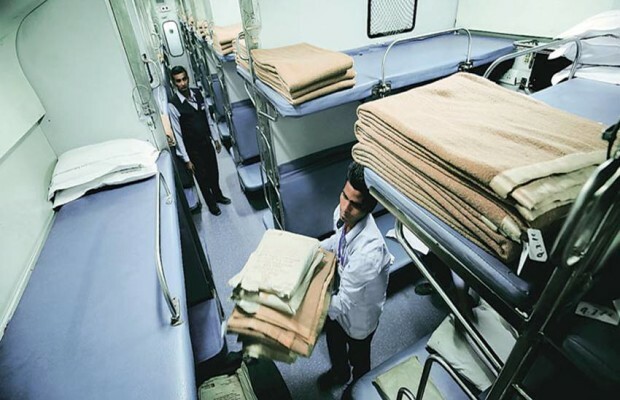 Faced with complaints of dirty blankets, the Indian Railways has firmed up an action plan to increase the frequency of washing blankets and replace the existing ones with designer, lightweight blankets in a phased manner. 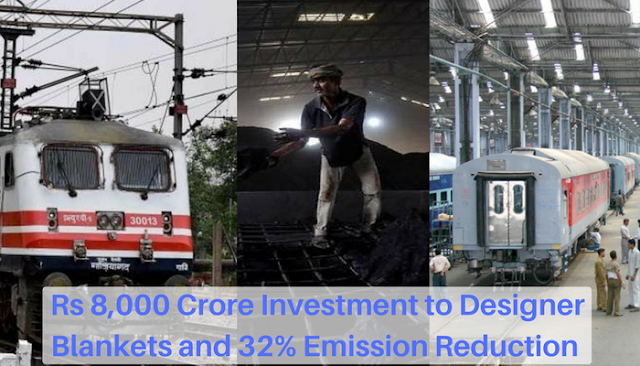 The Indian Railways will reduce its emission intensity to the extent of 32 percent by 2030 by taking a series of energy efficient initiatives. 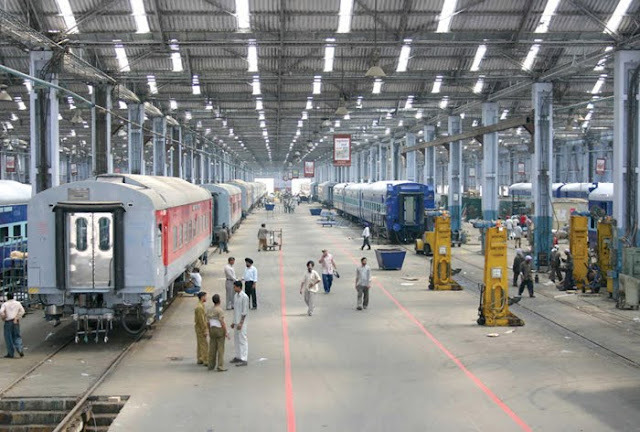 "It has also entrusted Rail India Techno Economic Service (RITES) for consultancy contract for study on emissions from diesel locomotives and setting up of emission standards," Gohain said. The MoS further said that the ministry had taken several measures to ensure compliance of the standards, including use of biodiesel blends and conversion of diesel power car in dual fuel mode.